The flattering self portrait above (I jest, I jest) makes my job look so easy…you know, just sittin’ around with my laptop, reading a magazine if the mood strikes me. Alas, though there’s plenty of downtime, working at a hotel front desk is much like being on stage much of the time. Unless you’ve developed a rapport with a regular/repeat guest, by default you’re doing your darndest to remain professional and exceed the guests’ expectations. In theory, at least. By the way, I aimed to title this blog Hospitalitystocracy, but the shoe wouldn’t fit the -stocracy pun I’ve got going, so I made do. Since ix-naying my Netflix, I’ve been relying on YouTube and the occasional Red Box rental to entertain me. (No regrets, by the way: Netflix dug their own grave by not offering more streaming options.) 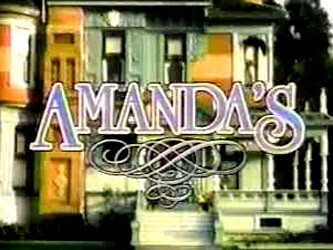 After re-watching the first season of Golden Girls on YouTube, I remembered the ill-fated Fawlty Towers adaptation called Amanda’s that Bea Arthur graced America with in the spring of 1983. 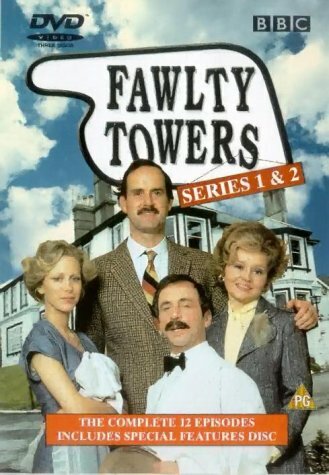 For anyone who’s unaware, Fawlty Towers is one of the best sitcoms ever produced; so good, in fact, that it only needed a dozen episodes to cement its place in history. Both the Britcom and the American rip-off revolve around the inept owner of a small hotel (a B&B of sorts, if you will) and the mishaps that the owner and their staff inflict on their unsuspecting guests. Hilarity ensues, as the saying goes, though more so in Fawlty with John Cleese than Amanda’s with the still superb Bea Arthur. (Her defense for the lacklusterness of the show is that she had a contract to fulfill with ABC after Maude, so I’m not sure she was totally vested in the show to begin with.) Both shows can be viewed on YouTube at the links below. Watch Amanda’s (By the Sea) HERE. -The guest is not always right. I actually worked at a motel back home where we had this infamous phrase framed on the wall, and even there it did not hold true. Sure, we are here to serve the guests, but there’s limits and logic to be used in every situation. -Pool parties are always trouble. I’ve called security/the cops on a Billy Ray Cyrus fan pool party, a family reunion pool party, and even an American Girl birthday pool party where another hotel guest claimed racial discrimination. Yes, absurdness like this really happens. -The bigger the hotel and the drunker the guests, the less likely they’ll be to find their room at 3AM. I had a guest at Opryland lecture me on the sequence of room numbers the hotel used, and I finally told him (as I escorted him to his room) that I wasn’t sitting in on the planning meetings for the design and layout of the hotel back in the 70s. -Finally, and best of all, hotel guests in Las Vegas are arguably the least likely to make noise of any hotel guests I’ve ever had the pleasure of dealing with. The simple fact is that after hours of roaming the Strip on foot, most of them are way too tired to raise a ruckus back in their rooms. I could think of plenty more, but I said I’d keep the list short. Bottom line: Hospitality is no different that any other line of work. There are good days/nights and bad days/nights, and one irate/ignorant/difficult guest can overshadow the 99 happy, content guests you’ve come in contact with over the course of a shift. I’d still take my current job over a ho-hum job working in a cubicle or dealing with the same co-workers and the same four walls every day. I never know who I’ll interact with on a daily basis, and what I’ll learn from that Asian tourist visiting America for the first time, or that old pepaw from Kentucky who just wants someone to talk to as he sips his coffee at 4:15AM while his wife is soundly sleeping. Happy Mother’s Day to all you mums out there! 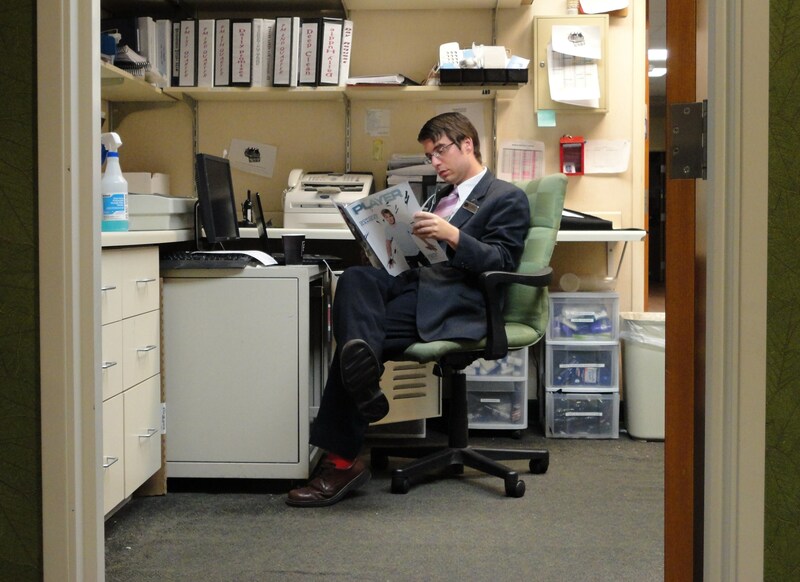 Great picture of you “working hard”…. 🙂 And I’ll be praying for your Granny’s recovery.